Every once in a while a game comes along that is so simple, and so straight forward, you scratch your head and think, "why didn't I think of this?". Then you realize you're laughing so hard from the resulting actions players take in the game to care and you just enjoy the ride for what it is! 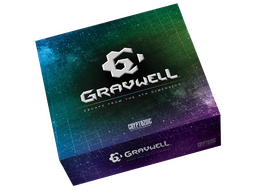 Gravwell, from Cryptozoic entertainment, does just that. It's a simple game to learn and to teach, but it will take you on a wild, fun filled, treacherous ride! And a ride you soon won't forget! We say it a lot in this video, but we'll say it one more time, this is the gem of Gen Con 2013. It's beautiful, it's simple, it's fun, and it's original. So why should we say anything else... let's play some Gravwell! That was simply outstanding. My wife and I just watched it together, laughing at the familiar moments. I'll be using this as my go-to play example. Outstanding job. I'm very grateful. Great review. I agree it is a fun game - picked up at Gen Con too. I find the more players the better the game. PS: There is no pull back into the Singularity, because you're on the OTHER side of the Black Hole. You've been spit out into the 9th Dimension and you're now adrift, expect for the elements you find to power your ship. PPS: In the 2-player game setup, the rules mention that you only use one Derelict ship on #36. I guess you guys have come up with a more friendly variant, as you can't get "stuck" with 4 ships in play. Thanks Matt! We totally missed the 1 Derelict rule, thanks for pointing that out. We haven't run into too many issues with two in a 2 p game, but we'll check it out. Thanks for watching and commenting! At first glance it looks boring and not much to the board. I actually saw pictures of the game board and didn't give it a second thought. After your Critical play though....Wow it looks like a ton of fun to play! What a gem it is!! I can't wait to get this game when it is released. And a nice price point as well. Again thanks for the play through I would of totally missed this awesome gem! Glad it helped raise awareness for you TimboIV. It was honestly something that going into Gen Con, I didn't have on my radar, but was SO happy I demo'ed it! Thanks for watching! One of the Cryptozoic booth guys tested our game with us and spat Gravwell at me, said he wasn't working the next day. I showed up at their booth the next day and he demoed it for me off the clock! love it! I have yet to meet anyone who didn't like it after one play... it's awesome! Hi colleagues, good post and fastidious arguments commented here, I am really enjoying by these. I have been exploring for a little for any high quality articles or blog posts on this sort of space . Exploring in Yahoo I eventually stumbled upon this website. Reading this information So i am satisfied to express that I've a very excellent uncanny feeling I found out exactly what I needed. I most no doubt will make sure to do not omit this web site and give it a look on a relentless basis. Aw, this was a really nice post. Finding the time and actual effort to create a superb article� but what can I say� I hesitate a whole lot and don't manage to get nearly anything done. If some one wishes expert view about running a blog then i propose him/her to pay a quick visit this web site, Keep up the nice job.